Instagram has released a new version of its app few days ago, with new features that i think you might have been waiting for all these while. The new version came along with Face filters and video re-wind mode. There are eight different filters to use on your pictures and videos. You can find them by swiping to the Camera and tapping the face icon. They work on both cameras (front facing or back camera) and you can also use them on Boomerang. Of the latest Instagram features, the video rewind mode is the most unusual. This feature allows you to watch your videos backwards. Well, you try it out and let us know what you think. 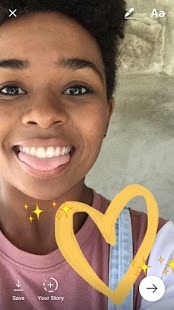 Also, you can add hashtag stickers to your Stories. Just tap the Sticker icon and type the hashtag you want to add. Here’s one more thing you could do: you can take a photo, fill it with one color, then erase some parts of the color to reveal some parts of your photo. Interesting? The latest update is already on Playstore for you to update. Though, Instagram has it that Face filters will be rolling out globally over the coming weeks.